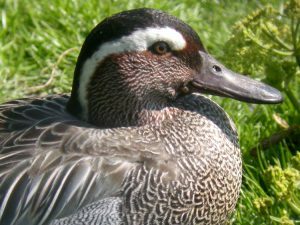 The Garganey is a species of small dabbling duck which breeds mostly in Europe and Asia. It is migratory in nature, thus moving to southern zones during winter. Swedish zoologist Carl Linnaeus described this species for the first time in 1758. The distinct features that make it easy to recognize the male are the brown-colored head and breast along with a white crescent line over the eye known as the supercilium. It has a slender neck, a flat crown and a straight bill. The face is reddish-brown in color. The color of the feet is gray. Other features include a white belly, gray plumage, bluish-gray forewing and long, beautiful scapular feathers that are gray or black and white. During flight, the blue speculum with white border becomes visible. The tertials have white marks which becomes apparent while swimming. 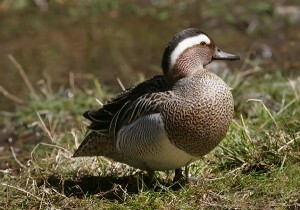 The females look like a female Teal but have a paler complexion. The head is more patterned. They long bill has a pale patch at the base. The color on the crown is dark. The light color of the supercilium contrasts the darkness of the eye-stripe and the crown. The speculum is dull green at the front. The back of the speculum is narrow and white in color. The grayish forewing and greenish-brown speculum becomes clearly visible when in flight. The length of the body varies between 37 cm and 41 cm. The wingspan varies between 59 cm and 67 cm. Their weight lies around 316 g to 502 g.
The Garganey is a dabbling duck; which means that they don’t dive into the water but feed along the water surface. They tip their head below the water line to search for food while their posterior portion remains above the water. They use their long and flat bills to grasp aquatic vegetation and insects quickly. These birds are diurnal as well as nocturnal in their feeding habits. While mating, both the parents take an active part in taking care of the young ones. They are also in the habit of migrating to southern areas during winter. The male bird has a distinctive, dry, rattling call. The call of the female is rather mellow; however, they can manage a faint quacking sound. The Garganey has a flight pattern that is quite fast and straight with rapid flapping of wings. They can rise from water easily using a wader-like flight. These ducks mostly feed on aquatic plants, small seeds, grasses, shoots, insects, invertebrates, mollusks and crustaceans. These birds breed mostly in the temperate zones of Europe and Asia as well as in the Mediterranean regions. They gather annually to breed in Wexford, Ireland. In Britain, they are commonly found in places such as Suffolk and Norfolk. Other European locations where these birds can be seen include France, north to southern Sweden, central Europe, Eastern Europe and Russia. In Asia, they can be spotted in places like India and Indonesia. Garganey is strictly a migratory species. During winter months, large populations of Garganey move to southern and western parts of Africa and Australasia. These ducks mostly like to hang around shallow freshwater lakes as well as marshes having abundant vegetation that merge into flood-lands, grasslands or other wet areas. They are also found in ditches, small ponds and irrigation pools. While breeding, they mostly choose grasslands in close proximity to steppe lakes and shallow marshes. The Garganey is often a victim of predatory species like the crocodiles, coyotes, gray foxes, red foxes and raccoons. The mating season for this species is from March to July. 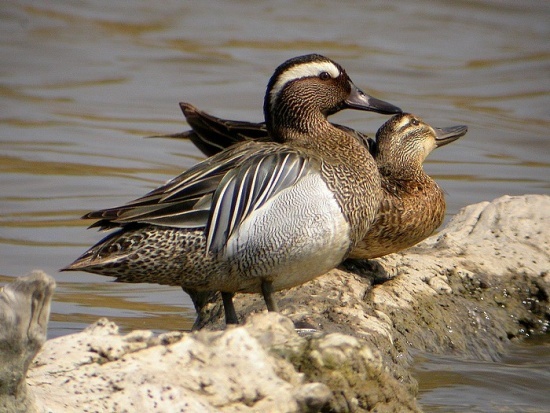 Garganey reaches sexual maturity around the age of 1 year, though sometimes it may be 2 years. In the breeding season, they build their nests on ground amongst thick vegetation, rush tussocks and grass. The nest is built fairly close to water, usually within 20 m to 50 m. The nest can be described as a shallow depression on the ground lined with grasses and leaves. Garganey is monogamous; they breed in pairs and are not colonial. The females lay around 7 to 9 eggs in a clutch. In some rare cases, the number of eggs in a clutch may reach around 14. The color of the eggs may vary from creamy yellow to light brown and light olive. The diameter of the eggs is 46 mm. The incubation period is around 25-26 days and is taken care of by the female. The young ducks fledge after about 6 to 7 weeks. Both the parents take an active part in rearing the young ones with the males guarding and protecting the chicks. The average life span of this species is around 20 to 30 years. 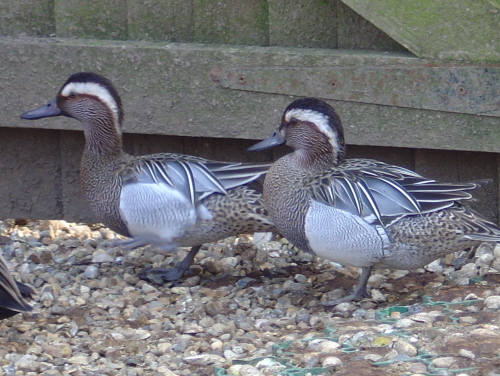 Garganey is often kept as pets. As pets, they need plenty of room and a watery habitat in the nearby vicinity. These ducks can be fed cracked corn, invertebrates like garden snails and mollusks, worms, night crawlers, small fishes and vegetables. The drinking water should always be maintained fresh and free of impurities. 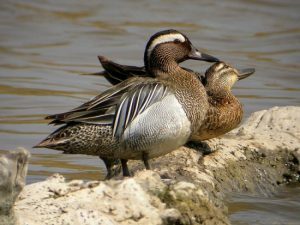 Care should be taken to provide Garganey with adequate protein. The food and water should always be non-medicated. Don’t store too much of mash feed together for a long time as this may lead to vermin and bug contamination. Habitat destruction by humans and other problems such as lead poisoning, hunting and botulism during summer months has been instrumental in reducing their numbers. However, the Garganey is listed in the category of “Least Concern” by the IUCN. Here are some interesting facts about Garganey. A group of Garganey is known by many collective names, such as “brace”, “raft”, “paddling”, “flush” and a “team”. A distinct feature of Garganey is the white broad supercilium above their eyes. This adds to the aesthetic beauty of these ducks. The Blue-winged Teal is another species of duck closely resembling Garganey, with which it is sometimes confused. These birds essentially feed by skimming. Here are some images of these beautiful dabbling ducks. The Garganey is a beautiful species; observing them in the wild while they swim or fly is a great natural spectacle. These birds are also popular as pets.